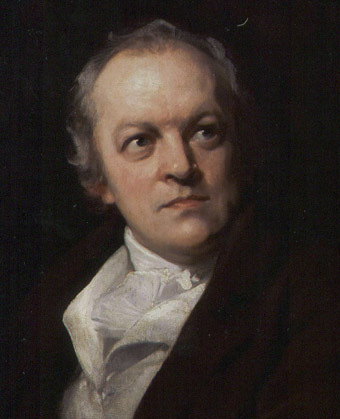 "I can look at the knot in a piece of wood until it frightens me"
William Blake was one of those 19th century figures who could have and should have been beatniks, along with Rimbaud, Verlaine, Manet, Cezanne and Whitman. He began his career as an engraver and artist, and was an apprentice to the highly original Romantic painter Henry Fuseli. In his own time he was valued as an artist, and created a set of watercolor illustrations for the Book of Job that were so wildly but subtly colored they would have looked perfectly at home in next month's issue of Wired. He lived in a filthy London studio where he succumbed to constant visions of angels and prophets who instructed him in his work. He once painted while recieving a vision of Voltaire, and when asked later whether Voltaire spoke English, replied: "To my sensations it was English. It was like the touch of a musical key. He touched it probably French, but to my ear it became English." Blake is now revered for his poetry as well as his artworks. Allen Ginsberg's life was changed by an overpowering vision of Blake (it's kind of sweetly pretentious in a way, isn't it?) in a Lower East Side apartment. Ginsberg often included a chant from a poem as part of his poetry readings; you can read it here. William Blake was born on November 28, 1757 in London. He died on August 12, 1827. No Responses to "William Blake"
What are the roots that clutch, what branches grow?